If you are an existing customer with a voucher booked onto a forthcoming flight and you need our weatherline phone number just click here to log in and the information you need will be at the bottom of the "My Details”" page. If you have not already registered you will need to do that first. If you need maps for our launch sites click here. What time of day do hot air balloons fly? 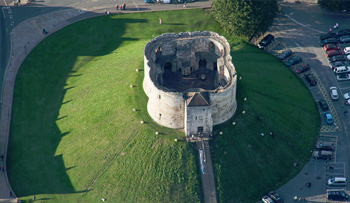 Where can I take a balloon ride in Yorkshire? 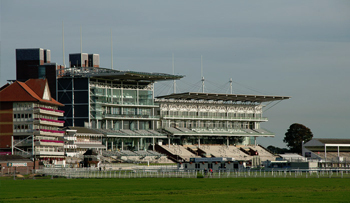 In York we fly from York Racecourse or from the banks of the River Ouse at Naburn Lock. Can I give a hot air balloon flight voucher as a present? How do we book a date for our hot air balloon flight? How many people fly in the balloon ? 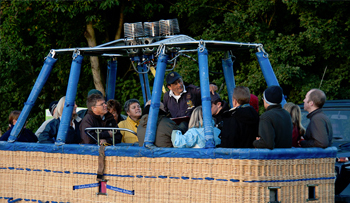 Can passengers help with the preparation of the balloon for flight? How far does a hot air balloon flight go? 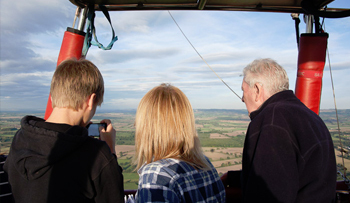 We travel at the same speed as the wind and since the hot air balloon can only safely be flown in winds up to 10 mph, we usually cover 7-10 miles, although it can be more or less! How high does a balloon ride go? We usually fly at altitudes of up to 1000 feet but we may climb to 5000 feet (around a mile high) to find a suitable breeze with which to travel. The balloon can only travel where the wind takes it and although not impossible, it is highly unlikely that we could land at our original launch site. After about an hour in the air your pilot will land in a suitable field. Once the balloon is packed away and we have 'toasted' our flight in the time honoured way (a glass of Champagne or orange juice if you prefer) you will be transported back to the launch site by road. What weather conditions are required for hot air balloon rides? For a successful flight we require light winds, no rain and good visibility. Call us at the time specified in your map pack to confirm if the weather permits us to fly, and if so the meeting time and place. Should we have to cancel your flight at short notice for reasons such as bad weather, we ask you to reschedule your flight as soon as possible to suit your timetable. What should I wear on a balloon flight? We recommend that you wear normal outdoor clothes such as those you might wear when going for a walk. Long trousers, long sleeves in natural fibres and sensible shoes or boots (no heels). 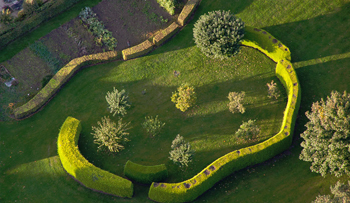 Avoid wearing loose jewellery or other items that could be lost in a grassy landing field. You should also bring along a well fitting hat to protect your head from radiant heat given off by the burners. Yes, you can bring your camera but please make sure you can stow it away before we land. 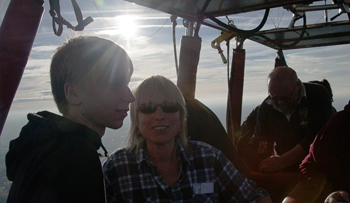 Do you have an upper or lower age limit for balloon flights? Regardless of age all passengers must be medically fit to fly. Our balloon baskets are about 1.1 metres (42 inches) high, and have footholes at each end to assist entry. Children under 16 must be accompanied by an adult on the flight and must be over 8 years old, and their height must exceed 1.4 metres (4'6"). In the interests of safety and operational requirements we cannot undertake the carriage of passengers whose declared weight exceeds 18 stone (114kg). 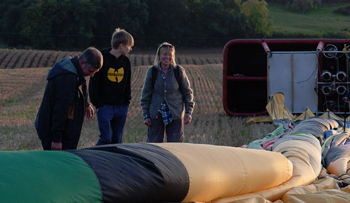 Can family and friends watch the hot air balloon flight take off? Family and friends are welcome to watch and take photographs. We would ask that they park their cars responsibly and that they do not trespass on private land. Is it true that the balloon basket always tips over on landing? Occasionally the basket may slowly topple over onto its side on landing but more often than not it will remain upright and alighting will be a civilized and dignified affair!